Shaun Williams' red card with 10 minutes to go added to Millwall's woes. Ian Holloway's side were looking to recover from their 6-1 thrashing at Norwich on Boxing Day, which left them three points away from the relegation zone. And, although the Lions looked composed in the opening stages of Sunday's contest, they could not match the Cherries, who are unbeaten in the league since September. Defender Sid Nelson, on his professional debut for Millwall, headed inches wide before Martin's effort was gathered by keeper Artur Boruc. After the restart, Millwall pushed to make the breakthrough but Lee Gregory shot over the bar and Jimmy Abdou's ball in evaded everyone in the box. Arter's strike was then blocked by Nelson before Dan Gosling fizzed his shot just wide for the visitors, and their victory looked inevitable when Williams received a straight red for kicking out at Wilson. Millwall manager Ian Holloway: "There is a nervousness in the team. The lads want to do well but then we go and get a player sent of. That is unforgivable and ridiculous. Williams should have just got on with it. "We are going to have to simplify things, play from back to front. I'm going to need some more choices and now and it's as simple as that." Bournemouth manager Eddie Howe: "It was a very hostile atmosphere but we dealt well with the challenge that was posed and concentrated on the football. "We always felt if we could keep a clean sheet, we'd have a good chance to win the game. We've been 2-0 ahead against Millwall before, so it was a good test for us to learn from the previous game." Match ends, Millwall 0, Bournemouth 2. Second Half ends, Millwall 0, Bournemouth 2. Attempt missed. Harry Arter (Bournemouth) right footed shot from the centre of the box is too high. Assisted by Callum Wilson. Attempt blocked. Marc Pugh (Bournemouth) right footed shot from outside the box is blocked. Assisted by Dan Gosling. Attempt blocked. Callum Wilson (Bournemouth) right footed shot from the centre of the box is blocked. Attempt missed. Ryan Fraser (Bournemouth) left footed shot from outside the box is close, but misses to the left. Assisted by Simon Francis. Attempt missed. 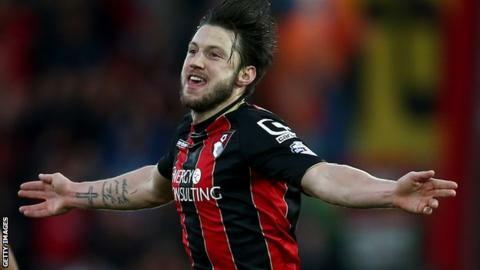 Harry Arter (Bournemouth) right footed shot from outside the box misses to the left. Assisted by Marc Pugh. Corner, Bournemouth. Conceded by Lee Gregory. Attempt blocked. Matt Ritchie (Bournemouth) right footed shot from the centre of the box is blocked. Hand ball by Matt Ritchie (Bournemouth). Attempt saved. Matt Ritchie (Bournemouth) left footed shot from outside the box is saved in the centre of the goal. Assisted by Dan Gosling. Shaun Williams (Millwall) is shown the red card for fighting. Attempt saved. Callum Wilson (Bournemouth) header from the centre of the box is saved in the centre of the goal. Assisted by Simon Francis with a cross. Attempt missed. Dan Gosling (Bournemouth) right footed shot from the centre of the box is close, but misses to the left. Assisted by Marc Pugh. Substitution, Bournemouth. Marc Pugh replaces Adam Smith. Substitution, Millwall. Alan Dunne replaces Danny Shittu. Attempt blocked. Callum Wilson (Bournemouth) right footed shot from the centre of the box is blocked. Assisted by Dan Gosling. Attempt blocked. Simon Francis (Bournemouth) right footed shot from outside the box is blocked. Simon Francis (Bournemouth) wins a free kick on the right wing. Corner, Bournemouth. Conceded by Sid Nelson. Attempt blocked. Harry Arter (Bournemouth) right footed shot from outside the box is blocked. Assisted by Charlie Daniels.